Devastating recent attacks raise the stakes for the government. On the last Sunday of March, a bomber detonated his suicide jacket inside Lahore’s Gulshan-e-Iqbal Park – one of the most popular playgrounds for children in Punjab’s capital, killing 73 other people – mostly women and children. On the same day, March 27, riots erupted in Pakistan’s capital as supporters of Mumtaz Qadri took to the streets. Qadri, a former police commando had been hanged on February 29 for the murder of former Punjab Governor Salmaan Taseer, who had called for reforms in the blasphemy law and supported Asia Bibi, a Christian woman believed to be falsely convicted over blasphemy. The rioters in Islamabad staged a sit-in near the Parliament House for four days, with a set of 10 demands, including official recognition for Qadri as a “martyr,” immunity for anyone killing in the name of Prophet Muhammad, no reform in the blasphemy laws, and the execution of Asia Bibi and others convicted of blasphemy. In January Jamaat-ul-Ahrar orchestrated the Bacha Khan University attack in Charsadda, killing more than 20 students and staff. The BKU attack was another manifestation of the Taliban going after soft targets. Since the turn of the year, TTP affiliates have attacked bus stops and a polio office, and have issued threats to educational institutes all over Pakistan, resulting in their prolonged closure following the BKU attack. The children’s park in Lahore is the latest soft target for the Taliban, signifying both strategic desperation and an evident intention to intimidate the society. 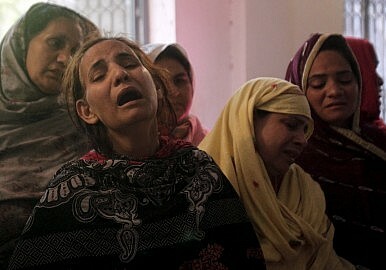 The Gulshane-e-Iqbal blast was the Jamaat-ul-Ahrar’s third prominent attack in Lahore in 18 months, following the Wagah border bombing in November 2014, and the Youhanabad church attacks in March last year, when Christians were targeted again in the Punjab chief minister’s constituency. Targeting minorities in the PML-N’s hub signifies the Taliban’s intent to test the resolve of the ruling party that has passed progressive legislations recently with regards to minorities and women. The recently passed Women Protection Act by the Punjab Assembly irked the Islamist political parties who united in Lahore on March 15, asserting that the act was “un-Islamic.” The Jamaat-e-Islami (JI)-led religious conference gave the government a deadline of March 27, to retract the act or “face countrywide protests.” On March 27, Gulshan-e-Iqbal Park was bombed in Lahore and Islamabad erupted with pro-Qadri protests. On Monday, March 28 the ISPR announced that Pakistan Army and Rangers had initiated a formal military operation in Punjab. The next day the provincial law minister Rana Sanaullah confirmed that more than 5,000 suspected militants had been detained in the two days since the Lahore attack. With prominent military operations already going on in the northwest, Balochistan and the port city of Karachi, Punjab’s immunity has been sanctioned by both the civilian and military leaderships. The ruling PML-N has long held political affiliations with sectarian organizations like Ahl-e-Sunnat Wal Jamaat (ASWJ), whose militant affiliates include Sipah-e-Sahaba Pakistan (SSP) and Lashkar-e-Jhangvi (LeJ). Meanwhile, for the Pakistan Army establishment, east-bound militant groups like Lashkar-e-Taiba (LeT) and Jaish-e-Muhammad (JeM) both have strongholds in Punjab. The Punjabi Taliban have camped inside the province since the 80s, when the Zia-ul-Haq regime groomed them as “strategic assets” for “jihad” in both Afghanistan and Kashmir. Post 9/11 the Punjabi Taliban and TTP have overlapped with the likes of LeJ, JeM and even al-Qaeda, to form a jihadist conglomerate spanning from Southern Punjab to Afghanistan. Meanwhile, Jamaat-ul-Ahrar has also pledged allegiance to the so-called Islamic State, also known as ISIS. In May 2015, ISIS, along with another TTP faction Jundullah, claimed an attack on Karachi’s Ismaili community to announce its arrival in Pakistan. Three months ago, an ISIS cell was busted in Sialkot, a city 100-km from Lahore. The eight suspects arrested belonged to Jamaat-ud-Dawa, believed to be the political wing of LeT. Two days before the Lahore attack Iranian President Hassan Rouhani arrived in Islamabad. Among discussions pertaining to energy, trade and security cooperation, Pakistan Army Chief General Raheel Sharif took up with Rouhani the issue of recently captured Indian Navy officer Kulbushan Jadhav, claiming that Jadhav had been sent on an espionage mission to Balochistan and that he had penetrated the Pakistan-Iran border. Even though New Delhi has accepted that Jadhav is a navy official, the video betrays more than a hint of ambiguity. Jadhav claims that he was the contact man for “RAW Joint Secretary Anil Kumar Gupta,” when no senior official in the Indian intelligence agency goes by this name. Reports claimed that a 7-point verbal agreement has been reached by the Islamist groups, including “no mercy” for those convicted of blasphemy in Pakistan and no alterations to the blasphemy law. While the government’s negotiation team had senior federal ministers Ishaq Dar and Saad Rafique, the Interior Minister said that the agreement was only verbal. The government’s desperation at making sure that no violence ensues was based on its prior experience in dealing with supporters of opposition parties PTI and PAT. For the Pakistan government, it was also important to prevent casualties, because they could ill afford further claims of “martyrdom” at a time when pro-Qadri protests have threatened to spill over throughout the country. With the military operation in Punjab, Pakistan has entered a decisive phase in its fight against the jihadists. But the government’s simultaneously ongoing clash against the Islamist political parties and protestors is arguably more crucial in winning the ideological war against religious extremism. Mumtaz Qadri’s execution and the successful resistance to his supporters’ demands could lay the foundation for greater reforms for religious tolerance in the country, including the much abused blasphemy law. The ambiguously phrased verbal agreement with the religious clerics in Islamabad won’t mean anything as long as the state steers clear of any verdicts against those accused of blasphemy. The eventual reforms to the blasphemy law need a lot of groundwork, before they can even be considered. Even so, the fractures between the civilian and military leaderships can undermine any fight against jihadism. At a time when the state needs to unite against all of its jihadist groups, the timing of the Indian spy’s unveiling appears to be a measure to distract the government from the ongoing negotiations with India over the Pathankot attack. The fact that both the attack on the Indian airbase in Pathankot and the Lahore blast originated in South Punjab needs to be considered by the Pakistani establishment, before moving on to questions over Indian involvement in Balochistan. At a time when sectarian outfits like LeJ, Kashmir bound groups like JeM, and the Pakistani and Afghan Taliban are all uniting, with many factions gravitating towards ISIS, Pakistan needs to realize that South Asia has a common enemy. Jihadist groups have long ceased to differentiate between one another, and are uniting in a common goal. The Pakistani government and establishment must show similar unity, and drop the decades old policy of “good” and “bad” jihadists. Kunwar Khuldune Shahid is a Pakistan-based journalist covering human rights, security, militancy, diplomacy, energy and finance. He is web editor for The Nation and reporter/columnist for The Friday Times. Correction: Based on early reports, this article previously incorrectly identified Mohammed Yousaf as the Lahore suicide bomber; Pakistani police have since said Yousaf had no link to the incident. The Diplomat regrets the error.